Two years ago, I found my dream home. A 1930s, semi-detached home with stunning, original features. We’re talking Art Deco stained glass windows, a spindled staircase, huge bay windows… it was way over budget and needed complete rennovation, inside and out. Three months later, I was a homeowners. 16 months later, and a whole lot of blood, sweat and tears, I finally started living in my dream home. Since I moved into my new home, it’s been populated with ‘days’. The day the fridge came, the day the sofa came, the day the carpets came and today, my most favourite of all, the day my piano came. I can’t remember a time when I couldn’t play the piano. Obviously, I wasn’t born playing a miniature piano and there was indeed a time when I couldn’t play… I just can’t remember it! My first piano lesson was when I was 5, a reception child. Growing up, I studied and completed many graded examinations, played in school assemblies and performed for whoever would watch. Naturally, my piano is my link with childhood. Before my piano arrived… I had a dining room. I know, a dining room. How ordinary! 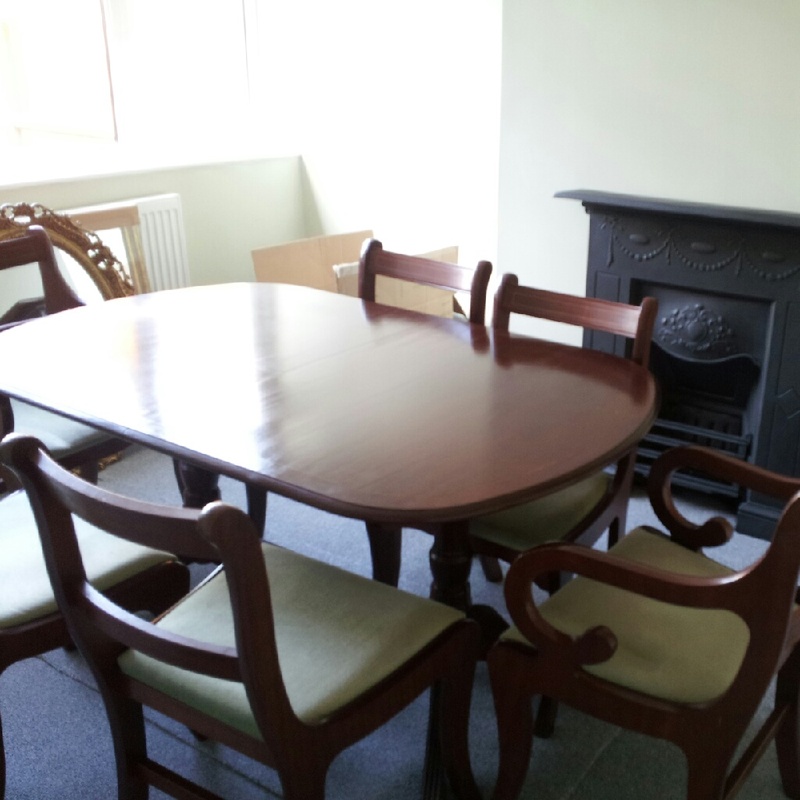 A room for a dining table and chairs. Since buying the house, I’ve always wanted the back room to be a music room. A place without television or mod cons. In summer, the late afternoon sun shines brightly in this room. It’s somewhere I can imagine letting the troubles of the day soak away, whilst listening to or playing music. However, I also want the room to have a homely feel and, in future years, it will have a large, tartan chair in the bay window and a stitching project draped over its arm. I’m a fan of most things Kirsty Allsop, let’s face it, she rarely puts a foot wrong. The most recently aired episode of ‘Kirsty’s Vintage Home’ drew attention to that fact that, sometimes, it can be hard to see the beautiful pieces you have, if they are not displayed properly. In my opinion, when you see an object day in, day out, it can lose its wow factor and becomes wallpaper. This rang true for me. In my garage, lurks boxes full of sentiment and a lifetime’s treasures, which I have received as presents, thrifted or acquired over the years. Since moving in 3 months ago, most of my belongings have yet to see the light of day. Venturing inside the garage, I was able to select pieces that I haven’t seen in month and really love. Here are my inspirational pieces. 1. 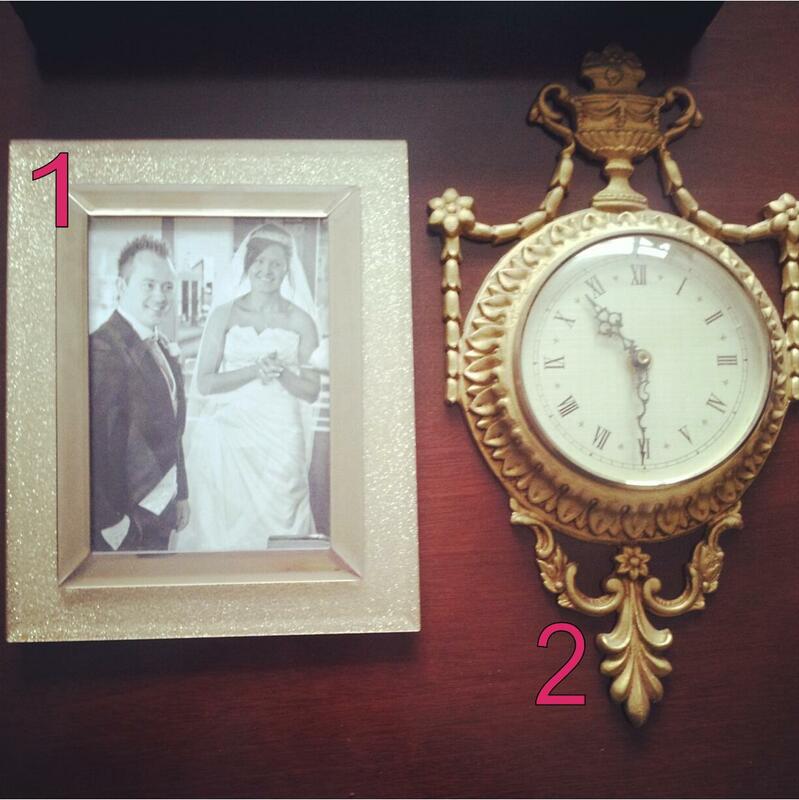 A framed photograph of my brother and sister-in-law on their wedding day. They bought me this frame for Christmas last year with a matching trinket. 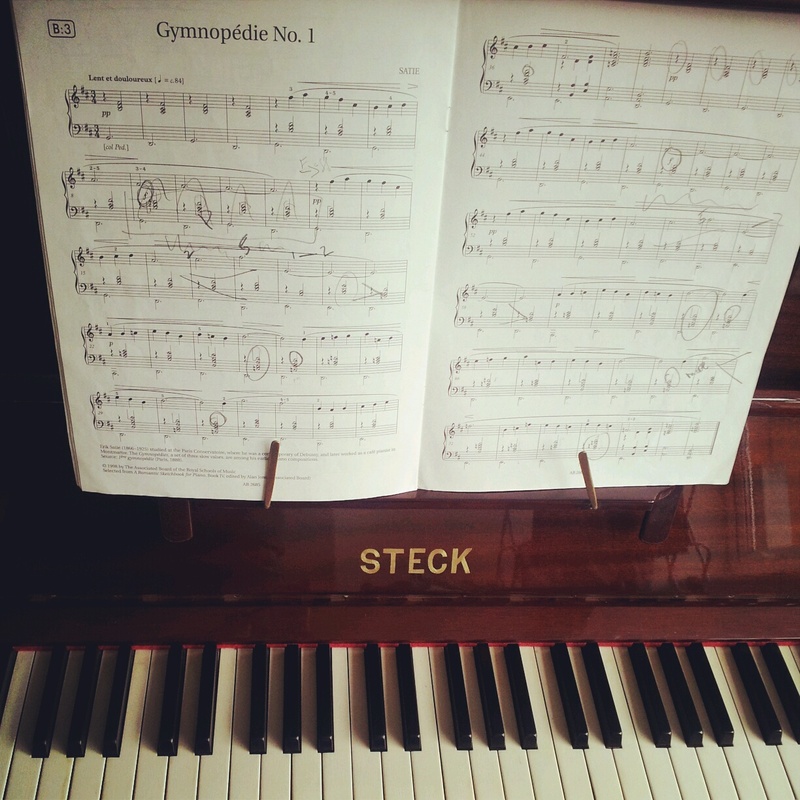 Even back then, as soon as I saw it, I knew the piano was a perfect place for it. 2. 1970s mock rococo clock. I found this clock in a charity shop in Lancaster, years before I even thought about buying a house. I love how ornate it is, despite it being practically worthless. 3. 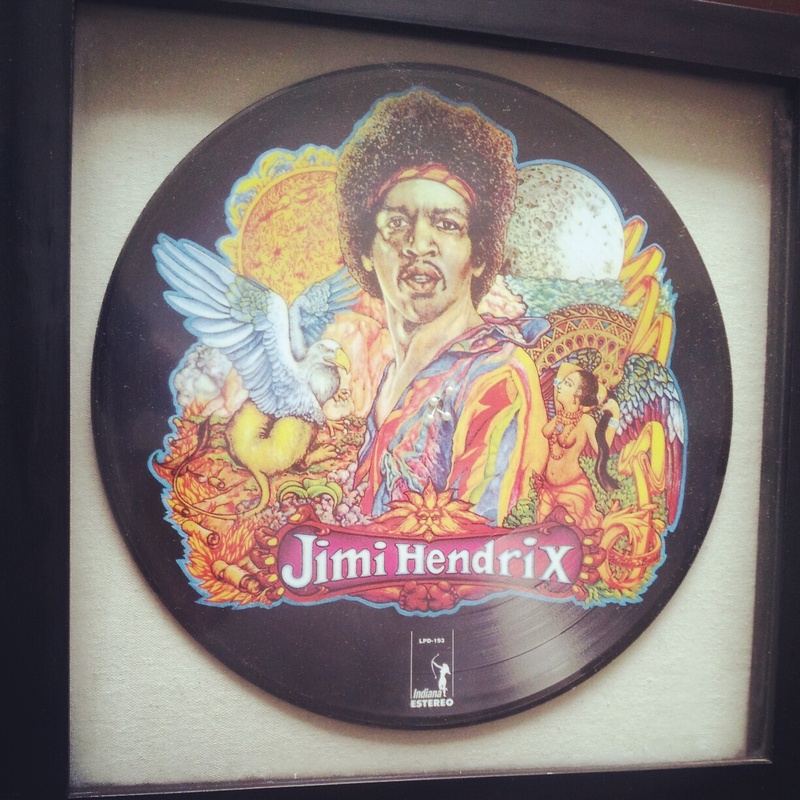 Jimi Hendrix painted vinyl. I’ve had this for about ten years, so long, I can’t remember where it came from! It wasn’t expensive, but I’ve always liked the colours and it ties in with my music room theme. 4. Cream manuscript holder. This is one of my most recent finds. It was purchased from a car boot sale in Warrington for £2. The seller even offered to include a matching napkin holder too. Erm, how kind? But, seriously, no thanks! Whilst I love how these few, simple pieces gave a homely look, in the future, I would really love to create a picture wall of golden frames and prints of 60’s icons to hang over the piano. This would really bring the musical theme to life! 1. 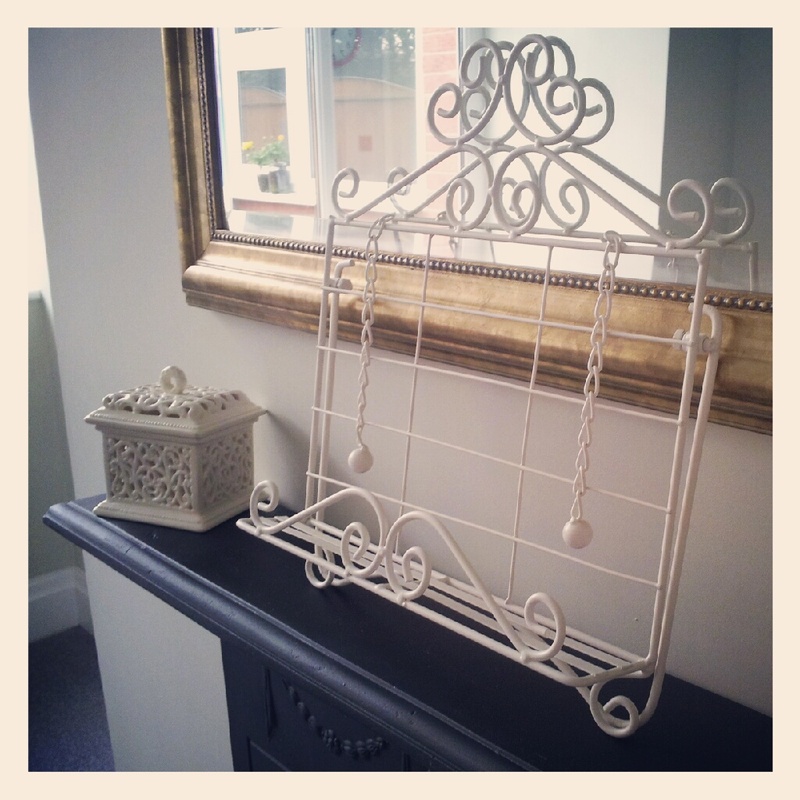 A variety of golden coloured frames, as ornate as possible! 2. Black and white photographs of 60s musicians; The Kinks, Rolling Stones, Joni Mitchell would be perfection. As always, I will show you the results. Do you have certain ‘days’ in your life? What has made you feel homely recently? Or, do you have a music room?